POND ECOSYSTEM: All pond ecosystems are unique in their own way. 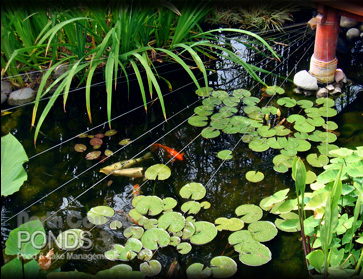 Ponds are a delicate balance of fish, plants, animals, and microorganism communities. With help from the sun, they work together as a symbiotic unit, whose natural functions feed off each other to help promote a healthy pond ecosystem. Fish waste is consumed by plants to help filter out harmful toxins. Microorganisms use oxygen, expelled from aquatic plants, to help fight green water and promote beneficial bacteria growth. 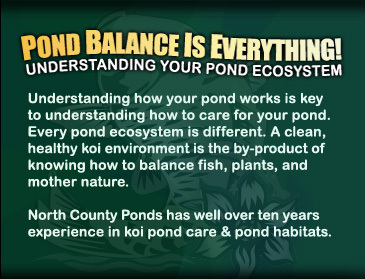 When it comes to pond maintenance, is important to delicately balance and control these aspects of your pond’s ecosystem. A well-balanced pond environment includes clean, clear water, adequate plant coverage, and healthy fish. All of this is achieved with the help of your pond pump and filter system and regular pond maintenance. The combination for a healthy pond ecosystem starts with an adequate pump and pond filter. Your pond pump must circulate the entire volume of your pond’s water 2x per hour. Your pond filter must also fit the flow rate of your pump to function properly. Without the correct pump/filter size ratio, your pond will struggle to maintain balance. Aquatic plants are an exceptional addition to your pond. Not only do they add a lot of natural beauty to the pond, they aid in filtration. Submerged, bog, or floating plants offer vital services for a healthy pond. They help remove fish toxins, fight algae, provide shelter, can be used as a source of oxygen, and add a lot of beauty to the pond.